Another hit product from Nestle, KitKat is one of the top selling chocolate brands in India. It has a slew of interesting and quirky ads promoting it on TV. But are its online efforts equally interesting? Let’s have a look, shall we? Over the years, KitKat has tried to position itself as the chocolate that people consume while taking break. Their communication revolves around the ‘Life is Busy. Take a Break, Have a KitKat.’ philosophy. And the same has been effectively replicated in their online communication as well. Having presence on all the 3 major social media platforms – Facebook, Twitter & YouTube – KitKat is doing a 360 degree promotion of its brand. It seems KitKat is undergoing a rebranding of some sorts on Facebook. 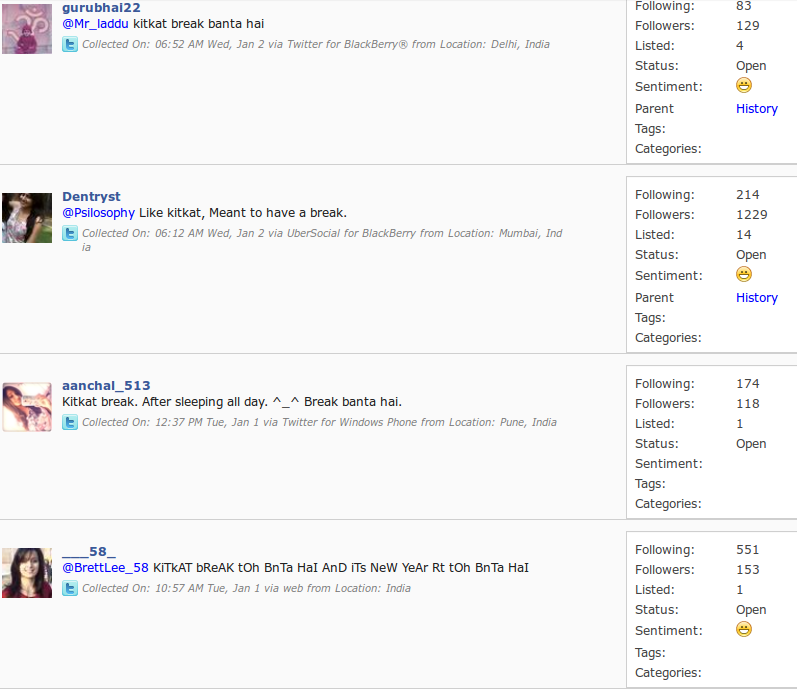 It has shifted its 1.1 million strong Break Banta Hai page to a brand new KitKat India page. Why? Probably because KitKat India is more ‘findable’ than Break Banta Hai. 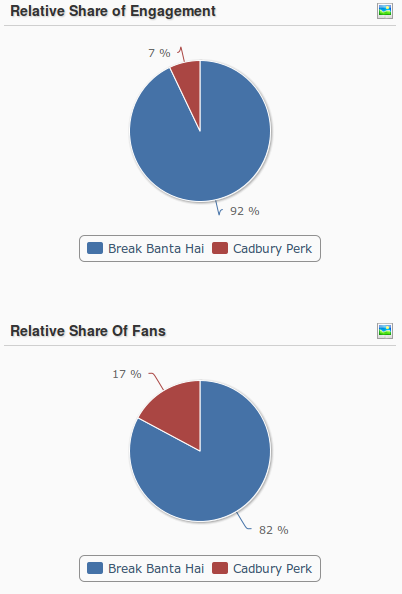 Since 1st December 2012, the Break Banta Hai page is sharing all the updates from KitKat India and is not creating any original content of its own. But I wonder why they can’t drop in a request to Facebook to merge both the pages, with KitKat India being the parent one. Yes, the one with less likes gets merged with the bigger one, but it’s not like Facebook doesn’t entertain special requests. After all the official Sachin Tendulkar page did merge the hugely popular Tendulkar Opus page with itself. The content strategy primarily revolves around taking a break from life, sharing happiness, friendships and other nice stuffs that chocolate brands can relate to: heavy on images. They also have a game going on side-by-side: KitKat Love Birds. It’s an interesting game with nice integration of KitKat within the gameplay. Though it doesn’t have any ‘uniqueness’ to it. Disappointment greets you when you visit KitKat India’s Twitter profile. It has nothing but cross posting from its Facebook page. No conversations, no Twitter-centric tweets and no leverage of any hashtags. I wonder why its 200-odd followers are following it for. What’s worse? They are not even leveraging the presence of influencers in their network. Started in mid-2010, the YouTube channel is again a storehouse for its TVCs. But the interesting thing is, there are hardly any videos that are longer than 30 seconds. I believe KitKat should invest more on producing long form interesting content to generate more traction. And a generous dose of paid promotion won’t hurt much either. Cadbury Perk could have done a better job than KitKat had they not been so pushy with their marketing campaigns. Their content has gone for a toss and it is focussing majorly on promoting its new TVS using a game which somehow didn’t work on my system. Not only does KitKat boast of a bigger community, it also has a good engagement to show off. And all this is because of some really interesting content. It is notable that Perk is missing out on both Twitter and YouTube. May be leveraging these 2 platforms can give it an upperhand these are where KitKat is lagging. KitKat’s ‘Take a Break’ brand communication has been effectively transferred to its social media communication. Weaving it with their content marketing strategy, they are doing everything to get the community engage with them. I would love to see some games/campaigns around the same theme. People are loving the brand. And not only are they loving, they have imbibed the ‘Break banta hai’ philosophy in their life as well. Nothing explains it better than their social media communication. Overall, the brand has done a good job at positioning itself. I would love to see a better effort on Facebook and some serious activity on Twitter and YouTube.